Health care institutions today are pressured by many challenges, such as decreased reimbursement, increased patient needs and fewer resources. To survive in this environment, chaplains must learn to communicate what we do in the language of health care: outcomes measures. Using metrics, chaplains can demonstrate what we contribute to patient care. Using one spiritual care department as an example, this presentation will help participants determine what to measure and how to measure it. It will also explore methods for gathering data, managing staff data entry and analyzing the data. Next, participants will learn how to use metrics to reveal opportunities and give clues for solutions to service gaps. Examples of reports for department staff, division staff and leadership will be provided. Finally, the webinar will discuss ways to overcome resistance to metrics through staff education, team accountability and celebration of improvement. 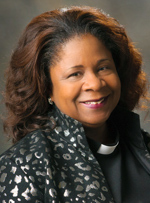 Gale Francine Kennebrew DMin BCC is the director, Spiritual Care and Education at the University of Texas MD Anderson Cancer Center, Houston, TX. She leads a hospital and ambulatory-based spiritual care department with a combined staff of 18, as well as the clinical pastoral education program. A BCCI board certified chaplain and ACPE supervisor, she received her doctorate of ministry degree from United Theological Seminary.